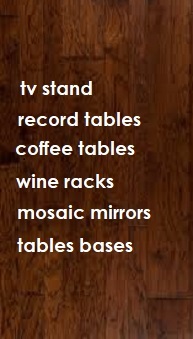 Welcome to our great selection of bases for your new mosaic bistro table. From heavy duty restaurant style bases to handmade wrought iron bases we want to give you the best choice possible so your new table will look the way you want. All bases come with fully adjustable levelers so you'll never have that irritating wobble, have heavy duty plastic glides on the feet so you'll never scratch your floors and are great for outdoor or indoor use. 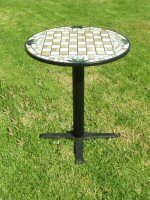 All of the table bases shown in this section are heavy duty, restaurant style and ornamental cast iron. Great for outdoor or indoor use, come with fully adjustable plastic levelers so you'll never have that irritating wobble or scratch your floors and look great with any table top you choose. All bases come with a one year guarantee against defects in materials and workmanship, are shipped in 3 pieces and are easy to assemble. If you need to purchase a larger quantity please contact us directly. are also available in Bar Height. 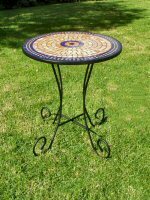 These wrought iron table bases are handmade from heavy duty, 1/2 and 5/8" inch wrought iron, are powder coated so they are great for outdoor or indoor use, come with adjustable levelers so you'll never have that irritating wobble and look great with any table top you choose. They all have heavy duty nylon levelers on the feet so they will never scratch your floors and take about 5 minutes to assemble. Shipping charges will be adjusted if bought with a table top.